Life can be overwhelming with all of the roles we play along with the bombardment of too many external forces such as news and social medias. Don't get me wrong, all of these inputs are okay, but it's how we handle these inputs and use them in our everyday life that matters. Over the years I have learned to see the many roles I play in my life as filters of perception for daily invigoration and inspiration. I truly believe that our imaginations are our most precious gift. I have learned to take all the mishmash in my head from the overload of daily life and get it out of my system through my artwork. By expressing these thoughts and ideas, it empties my tangled mind out onto the canvas of life helping me to paint the life I dream of. 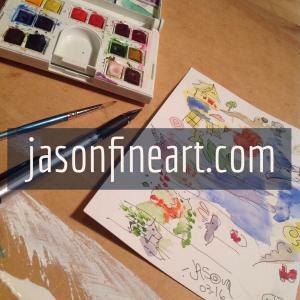 I am proud to announce the launch of my new online fine art gallery, www.jasonfineart.com, where I will be featuring selections of sketches, watercolors, and photography available for purchase as prints, cards, posters, canvas bags, and more. I invite you to share in my journey of viewing the world in new and inspiring ways through my artwork and photographs.